Once again, the main changes in the gardens, front and back, are to the trees. So Dante is taking us on a tour to see the current state of his estate. "Heer we are in da frunt yawd. Yoo kin see dat dere's many moar leefs on da grownd dan before." "An' dese leefs is orinj -- mai fafurite!" "Dis twee is called a 'Manitoba Mapull' cuz I gess dat's ware it wuz borned." "An' heer I is on da fwont steps, lookin' at da big spwuce twee fru da bushes." "Just lookit all da lovely awetum foliages undah it. Isn't awetum awesum?" "Heer's me an' FURnando in da back yawd. As usual, he's haffin' a snack." "Yoo kin see since last time, dat da Sunset Mapull has turned all orinj -- jus' da way I likes it!" "An' many moar of its leefs has fallen to da grownd." Before Dante can finish narrating the tour of his estate, Dylan does a 'drive-by snooting'! "Todai da shadoes is makin' me luks like a wacoon! ", says Dante. "Isn't dat funneh?" "Heer's a close-up view of da bootiful orinj mapull leefs." "Dey makes da yawd so colour full! But Daddy says he's gonna 'mulch' dem -- is dat anyfing like 'munch'? Dat's an awful lotta leefs to eat at wun sitting!" "Well, dat's the current state of mai estate. FURnando an' I hopes dat yoo enjoyed yoor visit. Until next time, so long mai furiends!" WORDLESS WEDNESDAY WITH DANTE: FLYING TOCKS! It's late afternoon on a sunny, autumn day and Dante is just basking in the glow. There's nothing much going on at the moment. All is peaceful, all is well. There's a slight breeze ruffling his fur. When suddenly, Dante feels a familiar presence. He turns to see his furiend, Mr. Squirrel, who is busy gathering a nut. Yes, you heard me! Not an evil squirrel nor a vicious squirrel, but a furiendly squirrel! There is obvious trust between the two friends, as Dante settles down to watch the antics. Mr. Squirrel just loves the nuts that mama scatters. He's very grateful, and such a good guest. Mr. Squirrel comes to thank Dante for inviting him to dinner -- instead of having him for dinner! And then he takes his leave, as good furiends do. He didn't want to overstay his welcome. Dante watches his furry little furiend walk off into the sunset and calls after him. THURSDAY IN THE GARDEN WITH DANTE: BLENDING IN OR STANDING OUT! Dante is in the back garden again, and there is not much that has changed since last week, except a few more leaves have turned colour. So Dante has taken on his secondary duties as garden ornament. In the Fall, he is the purrfect enhancement with his rusty orange hues. Here, Dante added his purrsonal touch to the back yard. It's funny how he blends into the scenery, but stands out at the same time. This shot is definitely a 'stand-out' even though Dante is lying down. I'm currently using this one as the background on my computer. From a distance, Dante tends to blend in more with his surroundings. I'd say this one's a definite stand-out. It helps that he's upright, of course. Still not blending in so much, but he does make a great autumn garden ornament. Now this one is a toss-up between blender cat and focal point. I think it's that face that pulls you in. And, finally, a close-up of the best garden ornament in the world -- in Fall, Winter, Spring and Summer. Dante's outstanding in all seasons -- even when he's busy blending in. EASY SUNDAY: DANTE AIRS HIS DIRTY LAUNDRY! It's Sunday, and Dante should be resting, but his fur coat is dirty and he has to wash it. He likes to do his laundry outside in the fresh air. Not only does it make efurrything smell better, but it dries faster, too! He thinks efurryone should have an outdoor washer and dryer. At first glance, Dante's fur looks lovely, fluffy and clean. It's his underwear that's the problem. How many of you would lick your own underwear? On Dante's washer, there is a 'tailspin' cycle. Sometimes the feet aren't level and it makes the washer rock back and forth. Time for a little readjustment. Socks need extra attention. It's the ground-in dirt that gets between the toes. Dante's not too sure he likes the taste. In fact, it takes a while for him to digest. Underwear and socks are all clean! Just let drip dry. Have a great Sunday efurryone! Hope you can keep your dirty laundry private instead of airing your privates publicly like Dante. Today Dante is in the back yard again. He is relieved that there is nothing untoward, and he can now enjoy the beauty of the colourful leaves. 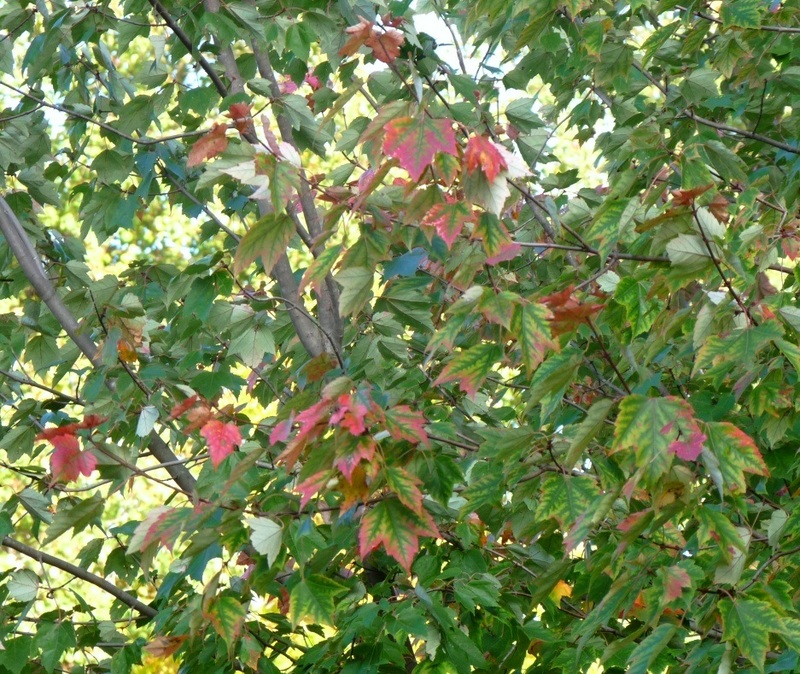 In our back garden we have two deciduous trees whose leaves turn colour. There is the crabapple tree which has yellow leaves in the Fall, and a 'Sunset Maple' tree which has bright orange to red leaves in autumn. The crabapple has already lost most of its leaves, but the 'Sunset Maple' is just coming into its glory. "Dese is our twees", says Dante. "Lookit da bootiful wed leafs!" "Sum of dem is orinj, too! I luvs orinj! Its mai fafurite culler." "The leaves of a red sunset maple tree are shiny green on top and pale green beneath in the spring and summer seasons. They typically have three to five lobes, and are up to six inches in diameter. The flowers are small and red, appearing in dense clusters during mid spring. Red fruit replaces the flowers in mid summer. Red sunset maple trees also have reddish stems and twigs, which provide a good deal of winter interest once all the foliage has fallen. Red sunset maple trees are relatively fast growers, and can grow up to two feet per year until maximum height has been reached. The sap of a red sunset maple tree can be used to make sugar, but this is of a lesser quality than that made by sugar maple trees. In the fall, the foliage of red sunset maple trees turns a beautiful crimson orange, and is one of the most beautiful trees during this time. Red sunset maple trees are highly ornamental, especially during the flowering period and in the fall months, but have lovely color year round." "I haff lots in commun wif da Sunset Mapull", declares Dante. 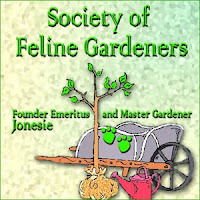 "We is bof weddish orinj and highly ornamentull." 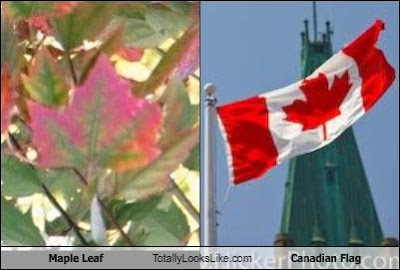 "Also, didya noes dat da mapull leaf is a pwoud Canadian symbull? ", asks Dante. "We even has it on our flag -- rite smack dab in da midull!" "Heer's sum moar pichurs, mama took of da mapull twee fru da leafs of da cwabappull." "Such pritty cullers, doan yoo fink?" "Uh-oh! Dere's sumwun else who is enjoyin' the leafs in our back yawd! He's got a two-pack snack in his pointy liddle paws. Efurrywun wonts a fwee lunch!" "I chased him, but he got awai AGAIN!!!" "O well! If yoo cant beets 'em, join 'em, dey sai. I'm gonna enjois the leafs wiles I can." As the sun sets on Dante and the 'Sunset Maple', all is as it should be. Seriously.